Taken from our photo album, this snapshot has a 1963 timestamp, way before the digital world that we live in today was even conceived. So many years ago, KeyTours was already operating a range of tours covering all the essential cultural locations around Greece. Here, this group is boarding for a tour of Old Corinth, Mycenae, Nauplio and Epidaurus. 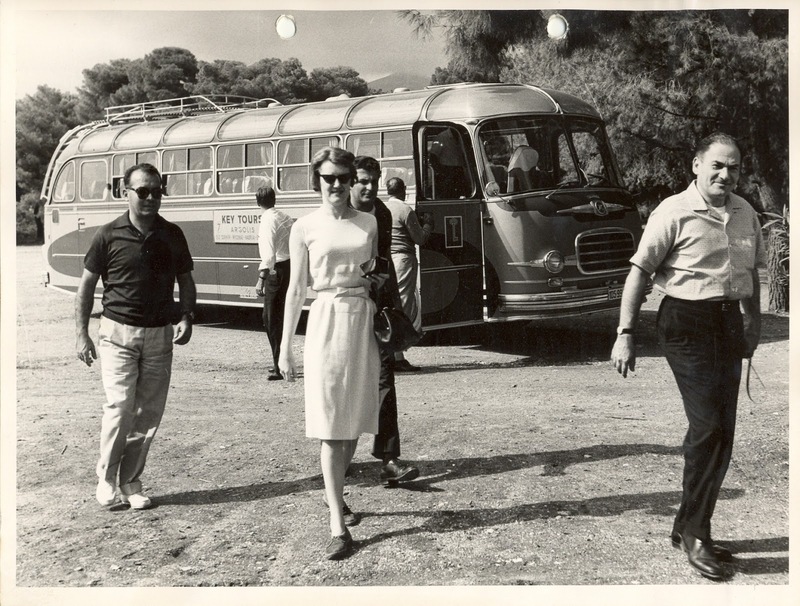 And here is another shot taken the same year, as travellers pause to enjoy a stroll and saunter around. And then came the liberal 70’s. And here we are again, on board, doing what we do best: guiding you through all the important details, every step of the way. Enter the 80’s and ... welcome colour photographs! What a world of difference colour makes. Don’t you agree? Below, four happy travellers proudly stand for their picture to be taken, with the magnificent Meteora in the background. Rolling with the times, Key Tours now takes travellers to Meteora in the fastest and most comfortable way possible, on board an exciting train ride! Check our latest video of the experience here. Into the 90’s, our Key Tours coaches patiently wait for the travellers to get their exploration and photograph fix! And below, here we are in action once again, this time at the mystical Delphi site, with its mysterious ancient past and its unprecedented spiritual energy. If you have never visited this amazing place, you are missing out on feeling its riveting power. It is a truly indescribable sensation being among the ruins of this oracle. At Key Tours, we are very proud of our journey, as we count more than 50 years of successful touring; more than five decades of sharing the sight-seeing experience of Greek culture all year round, 7 days a week. And what is the… key to our longevity? Our persistence in providing quality, value and high-standard tours that make each traveller feel unique. We have the means to give you the key, for unravelling all the fascination that is Greece.